Pembroke seconds stranglehold on division three looks to be on the wane after a few incredible years of success as they lie back in sixth place over the Christmas period. Each of YMCA, Corinthian, Monkstown and Three Rock have had their chances to make the lead their own in the build-up to Christmas but none took their opportunity and now all four are covered by just one point. 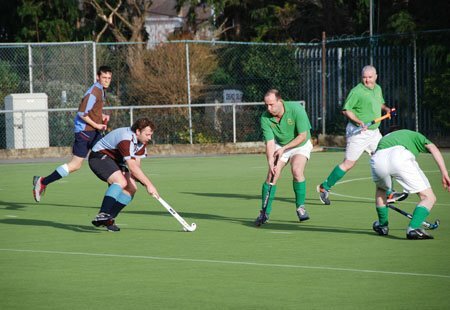 Glenanne, meanwhile, have worked their way into contention with four successive wins and have games in hand. This league looks set to go down to the wire. In a similar manner to division three, div four’s pace-setters from recent years are nowhere to be seen as Glenanne III’s struggle without the talismanic Keith Fishburne – who moved to Corinthian. Pembroke lead the way by four points, though Corinthian have two games in hand. They got off to a flyer this term with five successive wins but a 2-1 loss to Three Rock (though credited as a CHC win in the official tables) reigned in their advantage. In the largest men’s league in the country, those two look to be cutting themselves adrift of a league where every team is capable of beating each other. Pembroke IVs lead the way in another big league but St Brendan’s/Phoenix Park are in the mix with Dublin All-Ireland winning footballer Dessie Farrell still banging in the goals. They chose to enter this division since splitting from Portrane and are making a good fist of their efforts. Suttonians II and South East Wanderers are also in the hunt for promotion of the eligible teams. Holders Three Rock are nine points off the pace with four games in hands. YMCA V and Dublin Uni III lead the way with the latter looking for their fourth promotion since languishing in division nine back in 2001/02. They both lie three points clear of Fingal III and Avoca III – who have a game in hand. Avoca’s side mixes the very young products from the rebuilt underage set-up in Newpark and some intelligent old pros like Nigel Kingston, Trevor Dagg and, on one rare occasion, Johnny Watterson. The title looks to be between these four with ten games remaining. Navan IIs 2-0 win over Corinthian V just before the Winter break means the two sides are deadlocked on 22 points and well clear of the chasing pack with Mullingar II, Nass II and Skerries II over eight points adrift. The top two can both gain promotion with Navan’s home form likely to prove pivotal. Both the reds and the Badgers are 100pc so far on home ground. UCD III lead Kilkenny III by two points with their meeting on February 28, 2009 looking to be the key match-up in the race for the title. After claiming a number of Minor Cups, Kilkenny entered a third team into league action for the first time this year and could well add to their trophy cabinet. Glenanne V have taken the initiative at the early stages of division nine with three wins from four, three points clear of Navan IIIs and Pembroke VIIs. Dublin Uni IVs and YMCA VIs continue their long-standing rivalry in mid-table, inseparable on three points.